Do you ever find yourself unable to maintain focus on the job at hand? Or maybe (if you’re like me), sometimes you can’t even remember what you were trying to focus on? If you’re reading this, then that means you have internet, and THAT probably means that, yes. Yes, you have trouble focusing. If you take an already busy schedule and add apps that constantly say “CLICK ME!” with notifications, then add more competing priorities of work and home, then you have a recipe for distraction. Take it from me: I work from home, which means that I’m immediately surrounded by laundry, dirty dishes, (and during the summer, children) that want my attention the moment I step away from the sanctity of my home office. The last thing I need is an office environment that contributes to the mental chaos. So today I want to show you some of my favorite tools that I use to stay focused, reduce distractions, and stay motivated. Have shiny object syndrome? Don’t lose your focus or momentum when you see an article that you want to read or video you want to watch. Use pocket as a place to store all of those videos, articles, any ideas that pop up throughout your day so you can go back to them later. Pocket’s also available as a Chrome extension, so you can add things right from your desktop, your tablet, OR your phone- they all go to the same place! BONUS POINTS if you schedule a time in your calendar to regularly go back to those items (so they don’t just keep accumulating). If you have to slap your hand away from your smartphone to avoid visiting some of your favorite apps when you should be working, check out Forest. It’s available for tablets or phones. Set the timer for the length of time you need to stay focused, then put the device down! While the timer is running, you plant a virtual “tree.” Use your device while the timer is going and your tree dies. Womp, womp. Even better? Save up your healthy virtual trees and you can turn those into REAL trees to be planted by a Tree Planting Partner for a community in need. AWESOME. I’m not sure what the direct Android equivalent is for this app (if you know, please add a comment below), but I have to mention it because it is saving my sanity. At the very moment that I think, “Shoot, I have got to remember to do the thing,” I stop what I’m doing, and add it to my Reminders app. I can set a reminder to notify me if it’s time-sensitive, and I can even set regular reminders at just about any interval you could need (so I can actually, finally, keep a plant alive—fingers crossed). Use the "info” section anytime there’s more detail you need. This is similar to the Forest app, but works on your desktop or laptop. 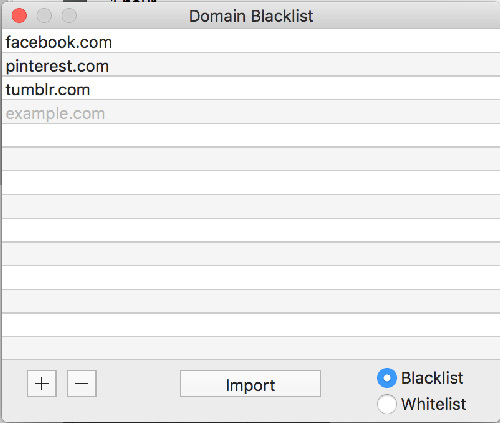 Blacklist the websites that tend to pull your attention away from your work(*ahem* Facebook), set your timer, then get to work. Self-Control will block your access to those black-listed sites while the timer is running. If you REALLY struggle with self-control, you can also choose to whitelist ONLY the sites the sites that you need to access while you work. Every other site will be blocked. Eek! OK, y'all! You've got the tools, now no more excuses! What tools are you obsessed with right now that help you be more productive? Tell me in the comments below. I LOVE productivity apps (and I love to go "app shopping" when my motivation is low), so hit me with what you got.